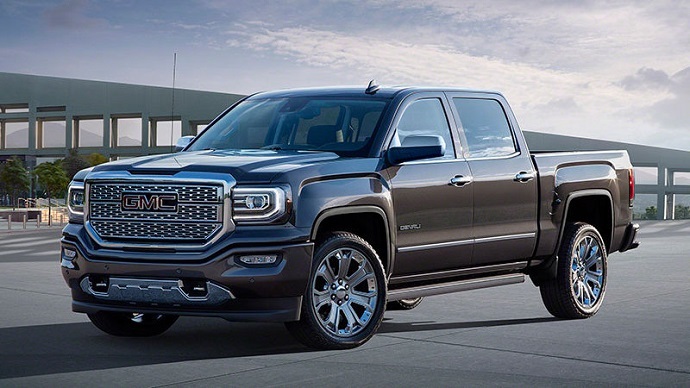 The GMC Sierra is highly reputable name in automobile industry and it covers full-size truck lineup from half-tone light duty Sierra 1500 up to the Sierra 3500 HD which is strengthened heavy-duty version. However when the GMC name is followed with Denali nameplate it is known that we deal with premium-grade versions. Denali badged models mean high level comfort, refined interior and otherwise optional features are standard on this trim. The Denali nameplate has been used since a 1999 model year for all SUV models and trucks. This nameplate is one of the most successful trims for the brand which accounts around 20 % of total GMC’s sales. However, GMC is ready to go even step further and new Sierra model will offer a top of the line 2017 GMC Sierra Denali Ultimate version. This new package standardizes otherwise optional features and adds several new ones as well. Some visual updates are also included and four-wheel drive is also standard. However, it will come with two engine options but mechanics remains the same as it was. When it comes to the mechanics the top-of-the-line 2017 GMC Sierra Denali Ultimate won’t be available with V-6 engine which is otherwise the standard in the lower trims. However, for Denali Ultimate model the standard engine will be a 5.3 liter EcoTec 3 V-8 which provides 355 HP and 383 pound feet of torque. More power and higher torque is available with a 6.3 liter V-8 engine which can produce 420 HP and torque of 460 lb-ft. Both engines are backed with brand’s EcoTech 3 technology which means they use direct injection, active fuel management and variable valve timing. This equipment level will exclusively be available with four-wheel drive with electronically controlled two-speed transfer case. The power from these engines will be routed to the four wheel-drive system through the 8L90 eight-speed transmission which is also mandatory for this trim. As for its handling and stability just like on the other Sierras, it will feature front struts and rear leaf springs suspension. However, things will even be better with this version which also adds magnetic ride control which will bring more refinement while driving. For well-controlled ride this model will also be supported with electric assisted power steering. On the other hand, another important aspect is fuel economy but official ratings haven’t been known. However, according to some available estimations a 6.2 liter based powertrain will return 17 mpg combined. From the visual point of view, the new 2017 GMC Sierra Denali Ultimate features the appearance which has several unique touches which will give it distinguished identity with a tone of sophistication. However, the model will actually exploit the design which derives from the 2014 model year and that means its overall shape and body sculpting continues unchanged. But thanks to well-composed front end it will look very modern and attractive which is hard thing to achieve with this kind of vehicles. The dominating feature up front is large, Denali, chrome grille complemented with pair of attractive headlights. Well sculpted bumper area which includes fog lights, skied plate, and dynamic lines also contributes to its look. Another piece of design which will attract attention are large 22-inch wheels which will be available with black or chrome inserts. Inside the spacious cabin, the driver and passengers will be able to enjoy in luxury appointments and modern technologies. High-quality, soft-touch materials will cover almost all surfaces while contrasting aluminum accents and stitching will enhance premium impression. The seats will provide good support and comfort and leather upholstery will be used. There will also be the latest iteration of IntelliLink infotainment system and strong safety package. The Sierra Deanli Ultimate will be available in Crew Cab models only. Summarization of features which distinguish this model from the rest of the Sierra lineup include mentioned 22-inch aluminum wheels, chromed tow hooks, exclusive grille design, LED headlights with unique LED lighting accents, LED taillights, and power steps with three-mode functionality. The technology sector based on the IntelliLink infotainment system will include eight inch display, navigation, Apple Car Play and Android Auto compatibility, etc. There will also be 8-inch driver display, wireless phone charging, Bose sound system, OnStar system with 4G LTE and WiFi hotspot, etc. The 2017 GMC Sierra Denali Ultimate will be faced with rivals that include top-of-the line models of the Ford F-150, and top Ram’s versions. It is expected to go on sale in this half of the year with price just above $60k.